I’m all out of bubblegum and I’m sick of the news — so Netflix it is. What do I watch on Netflix? Right now it’s the Vox show, Explained. There are episodes on things like K-pop and monogamy, but my favorite episode so far was on the exclamation point. Not only does it talk about the punctuation’s origin, and it’s larger societal implications, but there’s a part of the show all about the Interrobang (‽) my very favorite form of punctuation. 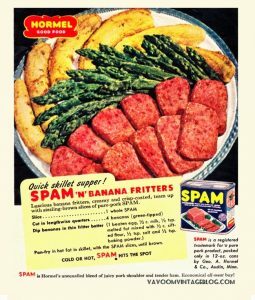 Along with this, there’s a tiny cameo from Salt Bae (referenced as a kind of human exclamation point), there’s also a shot of a vintage ad for Spam and Banana Fritters. I became a man possessed. The Va Voom Vintage blog has the recipe you see in the ad, but I was thinking of something slightly different. I wanted crispy spam in the center of a banana hush-puppy. With no recipe, just a silly rattling in my head, I made a banana batter with flour, banana, salt, sugar, baking powder, and soda. At the last minute, I remembered an episode of Mr. Rogers where he wrapped a banana in cheese, so, what the hell? 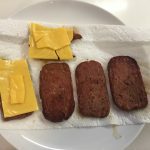 I put cheese in some of them as well. As you can see this recipe needs some work (at least aesthetically) but the product itself was decent. 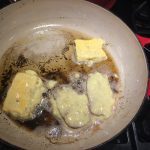 The cheese leaked, making a bit of a mess, and I think I need more flour or maybe some cornstarch, but what we have here is basically a banana pancake with a spam and cheese interior — which kind of made it taste like a bizarre reinterpretation of a McGriddle. 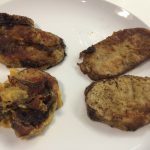 There are many ways to “die by banana” (here, here, here) — as I sink my teeth into the potted-meat-product-banana-cheese fritter I pick the most boring way to die. I choke on it. Even the bad things come to an end.